This is my boy. Yep. He’s broken two bones and been in the ER more than most people in a lifetime. His feet are rarely on the floor. He can’t sit still. He is interested in everything…but never for very long. He is likely to fall, likely to bust his head open just by walking into another kid and guaranteed to jump off a flight of stairs. When he gives you a hug…it hurts. If he sings a song…it’s 12 decibels above the tolerable level. Some say he is all boy. They are right, but it’s beyond that. He’s the kind of boy that gets a parent-teacher conference in the first month of school that ends up with a doctor’s office and a bottle of Ritalin. He’s the kid that would have been labeled “ADHD” before he learned half of the letters of the alphabet in a public school. After many years of sitting on the other side of that parent-teacher conference table, I can tell you that I am so thrilled that we have the privilege of homeschooling. My sweet boy can be all boy and I can choose whether or not I want to medicate him. I even get to choose whether or not I even want to label him. My best advice won’t be new to you. Surely these are things you have heard before, but they bear repeating. This really can wait if you are homeschooling. Allow them to be children. What is too early? Opinions vary, but I would challenge you to think hard about this one. Rather than banging your head on the wall everyday, allow your distractible child to wait until he/she is 6 or 7 before requiring a “formal” school time. Some would even advocate later. There is absolutely NO research out there that says that children learn best when sitting in a desk. As a homeschooler, you have the freedom to let him/her stand at the table, or learn math facts while doing hopscotch, or stand on his head while he recites a poem. Really, it will be ok! Formal lessons should be short and broken up. Teach him/her for 10-15 minutes and then go on a walk. Come back and teach for another 10-15 minutes then do the dishes together. There is no need to have a solid block of time, nor is there any purpose in sitting a child down for hours and hours of formal instruction. Remember, the purpose of formal instruction is simply to teach a concept. If the child is ready, this should take only a few minutes. Then practice can occur. But don’t forget to keep the practice short, as well. So how does All About Spelling fit into this? It fits all 3 of my above requirements….and more. I LOVE this curriculum. I love that it is grounded in solid research of the way that children learn to read, as well as, the foundation of the english language. I LOVE that All About Spelling assumes that your child needs short spurts of information, but makes no apologizes for high expectations. Children are expected to learn the way the English language works without a bunch of excuses like “these words just don’t follow the rules” or “we don’t know why those letters sound that way.” But it is presented in such a way that anyone can manage. I LOVE that the lessons are hands-on. He literally touches everything as he is learning…and it’s expected. Don’t miss this crucial final point—>It’s simple and easy for a busy mom of 4 kids to teach. Be encouraged, mama. You are blessed with the opportunity to meet your child’s needs personally through homeschooling. Some days may end in weariness, but in the end, the sacrifice will be worth it. Your child WILL read! 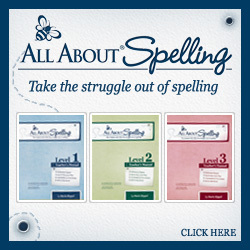 Ready to try All About Spelling or All About Reading products? Click below for your FREEBIE! I’ve used All About Spelling for quite some time now and I’m a huge fan for the way it teaches children to have a solid relationship with words. This relationship LEADS to strong reading and writing skills. Should your child need more specific focus on reading, I would recommend that you consider All About Reading, as well. The website goes more into detail about their recommended sequence. I’m using All about Reading for my two oldest (almost 5 and 6) and it really is a perfect reading curriculum for boys who need to move around. I love that it’s so hands-on and the activities are different every day. My middle son – like your son – would probably have been labeled ADHD as well and AAR works for him…I break it down into shorter lessons and it takes us FOREVER (like, several days) to get through a lesson, but he really, really wants to learn to read and this is working well! It sounds like AAS would be a better fit, yes. I think AAR would be too repetitive and possibly to simple for his level. My 6th is a totally easily distracted boy. He’s later learning to read than my other children, but I know this is due to my busyness with his older siblings and their school and his inability to stay focused. This summer we’ve been spending one-on-one time together for about thirty minutes in total and his reading has exploded. We do different short activities so he stays focused. If he starts to fade I release him to run around for a while. He always comes back refreshed and ready to study. Every day he reads short books to me. It really is all about keeping it short and interesting and letting him wiggle. He would never make it in a formal schooling situation. Oh my goodness! I just started “All About Reading” with my second child and was just telling my husband how I wished I had done it last year with our first child. I had no idea they had an “All About Spelling program”. Here is a question for you – My oldest is in First grad and I have been using Abeka with him for spelling and language (which he really is not enjoying anymore). Do you think it would still work to switch over next year? Or possibly even this year? There are very few homeschool curriculums that I am not fond of. Abeka is one of them. But more importantly, if your son isn’t fond of it, why not switch now? You can start it anytime and move at any pace! We have an “always going” little boy as well. I just wanted to share that changing his diet made a HUGE difference. We cut out all artificial food dyes, flavors and preservatives and had a new kid. Check out Feingold diet for more info….though you don’t have to do their program (all the work is just done for you…so it’s easier) =D Thanks for this post…we are using and loving AAS and AAR. I’ve heard this from many parents. We are feeding our kids such junk these days. Thanks for your suggestion! Oh this is my 6yo! My bigger boys aren’t like this and I came from a family of four sisters so this level of energy is new to me. I come to the end of many days DONE with this child, praying for the patience to get him to bed without losing my cool (again) with him. He will sit and do math for hours and then sneak off at “reading and writing” time. He is my muscle, a man’s man. I really try to play on that during the day but a lot of time I don’t have the energy or thought process to engage him in such a different way. That’s how I found your article…looking for ways to engage him productively during the day. My oldest is going into kindergarten next year (so I am a total newb compared to all of you) and I have been really stressing about what on earth I am going to do for kindergarten. We’ve done mostly learning through play and we’ll still use that as she is still young, but I also wanted some curriculum to help us stay focused and organized. It’s been hard to pick one; I have a girl that can keep up with the boys with her energy level (or even give them a run for their money). She’s been writing her name since before three, and since three has known her letters and mostly could remember her phonics. With my help she could write out words as we sounded them out together. So I thought she was totally ready to try “Teach Your Child to Read in 100 Easy Lessons” at four. My inexperienced self did not know she was way too young 🙁 We stopped at lesson 8 when she started acting depressed about it. I have apologized to her for trying it too young and I pray to God to redeem the experience (I was just reading that if you try to teach them something too young that it rewires their brains in a negative way. Praying for God’s grace and mercy on that!) She has struggled to remember things she previously knew, but I’ve also struggled to review as our family has been through a lot of transition. We may try that book again after she turns five, but I am really intrigued by All About Spelling and how a lot of you say it works for high energy children. I’m definitely going to look more into it! A month ago, I would have thought you were crazy to delay school. But then I read about Finland. They were marked as the #1 country for education a few years ago and they wait for formal education until age 7. I think you still need to teach basic skills like counting, colors and such. I would also read to my child a bunch and hopefully, he would begin to read sight words and understand about text.